Some recent threads here, and some recent projects at home, sparked a dinner conversation the other night when a friend and his wife were over for dinner. I was just finishing up some chores myself when they arrived. Heâ€™s been pestering his wife to let him buy a small tractor (~20hp CUT) for doing chore work around both their home and summer place so he quickly turned the conversation to my chores with the tractor when we sat down for a glass of wine before dinner. I must say his wife was rather impressed at the list of things I could do with the tractor. My wife chimed in to say that she got nearly as much â€˜seat timeâ€™ in it as I did and that she loved doing stuff with the tractor. This got me thinking about a thread here where we can share ideas, uses and tools that make the little beasts we have more useful to us. Myself, I (because of health issues) use the thing like a Swiss Army Knife, I can use it as a labour-saver for nearly anything. For example, the FEL, with just the normal bucket I can move all sort of stuff, especially with the addition of a couple of chain hooks to strap stuff in or to pick up other items. Iâ€™ve even carried water around in the bucket, although it sloshes a lot so usually use a barrel. The bucket is also an outstanding work saver with handling firewood, itâ€™s amazing how much less stacking firewood is when you scoop it up, then carry near to where it is to be piled, then the bucket left at chest height. When you donâ€™t have to bend down and pick up the wood, itâ€™s a lot less work!! A set of forks can be very useful for lots of things too. With the forks pushed together or used single they make a fantastic tool for small stumps, buried rocks, trenching and all sorts of digging. A pallet on the forks makes a dandy carry-all too. Want to clean up pine straw fast? Turn a rear blade around backwards and shove them into a pile! The jumbled mass of needles just stick together into a big clump. Agree with all for uses other than farming in my case. Then come attachments. There are many. While they don't get the use of the bucket, they sure save time, and allow work that otherwise might not get done as well or at all. 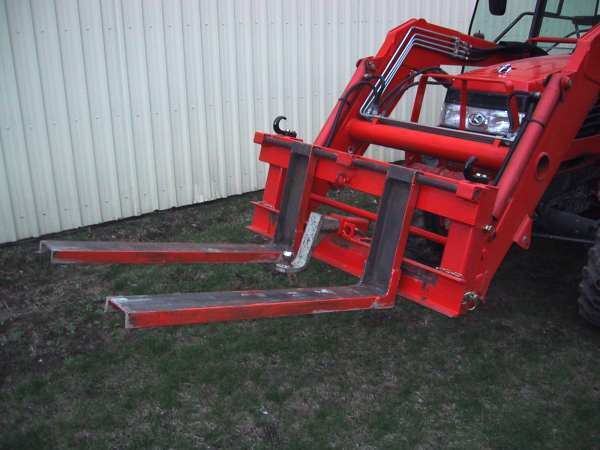 One attachment that certainly should be on hand for most tractors. I leave mine on most of the tine. It is a quick hitch for rapid three point attachments. For instance, I made up a bracket to fit on it containing two trailer hitch balls as well as a clevis for rope. While manufacturers are right saying any heavy towing should be done from a level lower than the rear axle to minimize the risk of the flip up over backwards accident, I find that most of my pulling by the three point is rather light, such as trailers or lawn sweepers. My second and third quick hitches came from Harbor Freight and are equal to higher priced items. 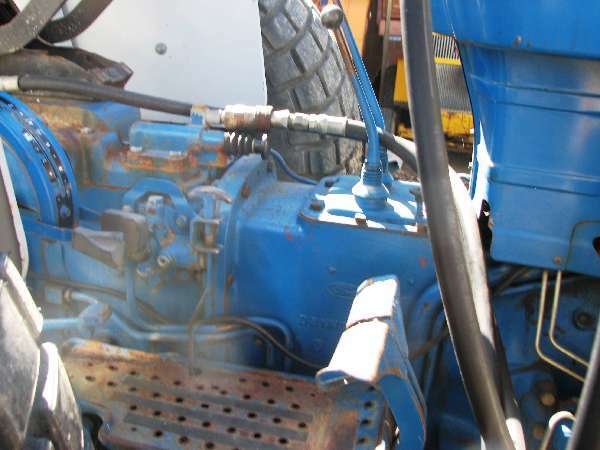 Another useful attachment that is very handy in case of power outages is a PTO powered generator. The list goes on. Here is a clue for handling earth, stone, etc from a pile, If possible use two tractors of unequal size. Working toward each other they pick up all the stuff without any hand work. My 4310 Deere is a 99 model, I think, anyway I bought it new with a 430 loader. The salesperson showed me how easily the loader comes off and goes back on. I've never had the loader off, it seems that 75% of the things I do involve using the bucket, the forks or the clam bucket. If I use the rotary mower or rear finish mower I just drop the bucket off. The box blade stays on the three point most of the time when the tiller or one of the mowers isn't on. I could do these things with one of the farm tractors I have but it is lots more fun with the little one. Frank, I too have never had the FEL off the tractor. In fact most of the time I have my homemade utility bracket on instead of just leaving the FEL empty. I found that it never failed, as soon as I got the tractor more than 100' I found some reason I needed a trailer moved, or to pick up something. So I built the bracket. It's my picture # 18 shown below. Although I now have a dedicated set of forks, so I rarely use those forks much. I have lengthened them though, so they are very handy for things like gathering and carrying brush. I also made up a gin pole that goes into the trailer hitch in it, with that I can reach up about 12' and out beyond the front wheels by about 10'. In fact I even used it to retrieve a nieghbours stallion that broke through the fence line and was running free up & down the road. Three of us managed to get a rope halter and stout lead-line on him and I tied him off to the trailer hitch and backed up 'leading' him home, he didn't like it much, but didn't have a lot of choice either! It looks like I need to update some of my pictures too. I find a rake is right handle for clean up of limbs, leaves, and leveling dirt. Don't have a FEL but have a 3 pth bucket that works like a limited bucket with hydraulic cylinder for third arm. Find the thumb on my compact excavator very handy in loading fire wood while in long lengths to haul in dump body to cut after dumping. I still like a heavy rear blade for light ditching or building or repair roads. Use a 55 gallon sprayer with orchid tree nozzle on it for many washing and spraying jobs. OH, additional lights. Helps a lot to be able to see. I forgot about the landscape rake, it is handy for more things than I'd ever dreamed. It does a great job of leveling crushed rock, pushing snow back, and even raking up things like it was meant to do. I had a regular three point blade for a while but sold it, it just wasn't heavy enough to do much unless the soil, gravel, or whatever was already loosened up by another means. The box blade was a surprise to me, I had never used one before. With the scarifiers down it will rip loose and move a lot of soil in a little while. Another thing I forgot is the #48 backhoe attachment. Not a monster machine to bury a giant boulder, but real handy to fix field tile, jerk out medium size rocks and stumps. Like they say I can do just about as much as the regular tractor hoes, but just give me lots more time. I think the newer models mount even easier and quicker but the 48 isn't too bad about fifteen minutes either way on or off. I guess I will have to say that whether you call it work or play the compact tractors are a great machine. I see lots of them go past on landscaper trailers, pole building crews, etc. I made a set of baffles and a cover to reduce (not prevent) splashing out. For spraying, I made up for a 12-v pump a weighted and screened intake that goes into the bucket, connections to my external battery terminals, and to a wand I operated from the seat. Worked well, but a bother to set up and take down each time. Princess Auto was selling plastic tanks with built-in 12-v pump plus hoses and wand (white, I think 15 gal and designed to strap onto ATVs). Got one. Fit nicely into the bucket, no spills. Adapted the electrical connector to mate with mine. Takes one minute to set up or remove. When they went on sale (for less than just the price of a pump) I got three more, for plain water and different sprays.